Are you ready for a gift that's just as unique as you? 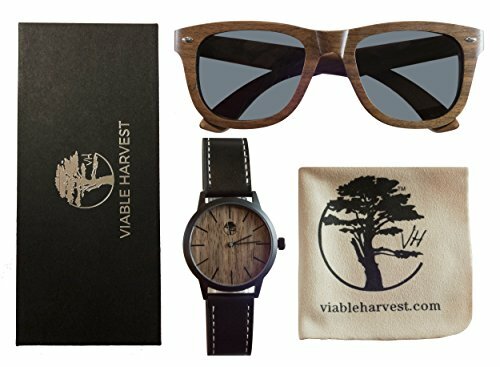 Our designers at Viable Harvest have created a brand new gift set that features a hybrid watch with a walnut wood face and black stainless steel case and paired it with organic walnut sunglasses in a classic wayfarer design. Our customers get the best of both worlds - an amazing watch AND beautiful matching sunglasses! 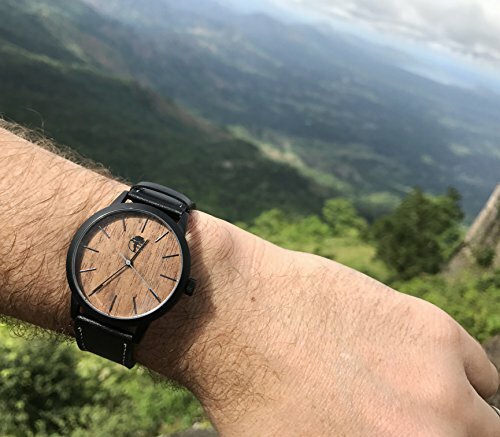 The watch is made from organic walnut, but has the added durability of stainless steel. Not only does it look and feel great, but it's also 3ATM waterproof compliant! Whether you're indoors washing your hands or outdoors in a wet environment, the Viable Harvest watch is built to last! At just under 2 inches, the faceplate is easy to see, clear and incredibly durable. With a striking black inlay and a second hand, you'll never struggle to see the time. The Japanese quartz movement keeps precise time day after day. The strap is 100% genuine leather and is soft, easily adjustable and reinforced with heavy-duty stitching. Ready for a great pair of shades? 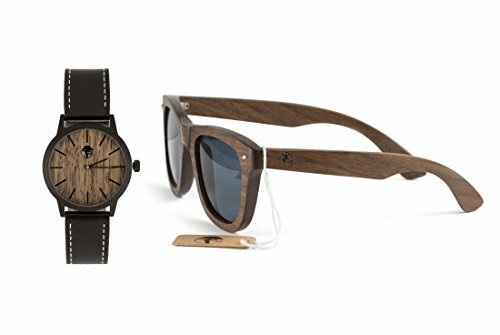 Our sunglasses are hand-crafted with organic red sandalwood for a unique design that looks and feels great. With sleek lines and a leisurely style these sunglasses are ideal for the backyard or your next great adventure. We love the red sandalwood not only for its strength, but for its unique grain and color pattern that boasts nothing but style! We use premium high quality certified polarized lenses with a UV400 rating. A universal fit and unisex design make this gift set a great choice for everyone! Going casual? No problem! Dressing it up for a day out? We've got the look for you! We've also included a custom designed bamboo gift box with a soft microfiber cleaning cloth. At Viable Harvest we care about our customers. If you're not satisfied with our watch or sunglasses, let us know. We'll do everything we can to make it right. We've got a 100% money back guarantee to boot. So go ahead and order. We've got you covered.